This Thursday, Hindus across the globe are celebrating Thaipusam. Most Malaysian Hindus will be at Batu Caves and other Hindu temples giving thanks and fulfilling vows to the Hindu god Lord Murugan. 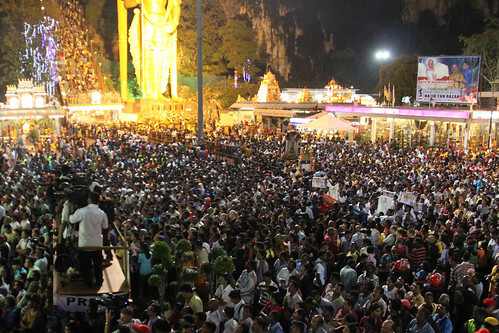 Already, thousands have flocked to Batu Caves since earlier this week, with more than a million expected to make the pilgrimage this year. This year, I will not only travel to Batu Caves to witness this wonderful cultural phenomenon, but also to Sungai Petani, Kedah later in the day. I am looking forward to meet with many Malaysians of Hindu faith at the Subramania Swami Devastanam temple there. Thaipusam here has become such an international affair, as I observed in my visit to Batu Caves during the festival last year. Hindu devotees from overseas as well as tourists come here to appreciate the wonderful diversity of our culture and the openness in which many different faiths are expressed and practiced. As Malaysians, we must continue to appreciate and nurture this unique strength, in the true spirit of 1Malaysia, People First, Performance Now. A Happy Thaipusam to Malaysian Hindus everywhere!